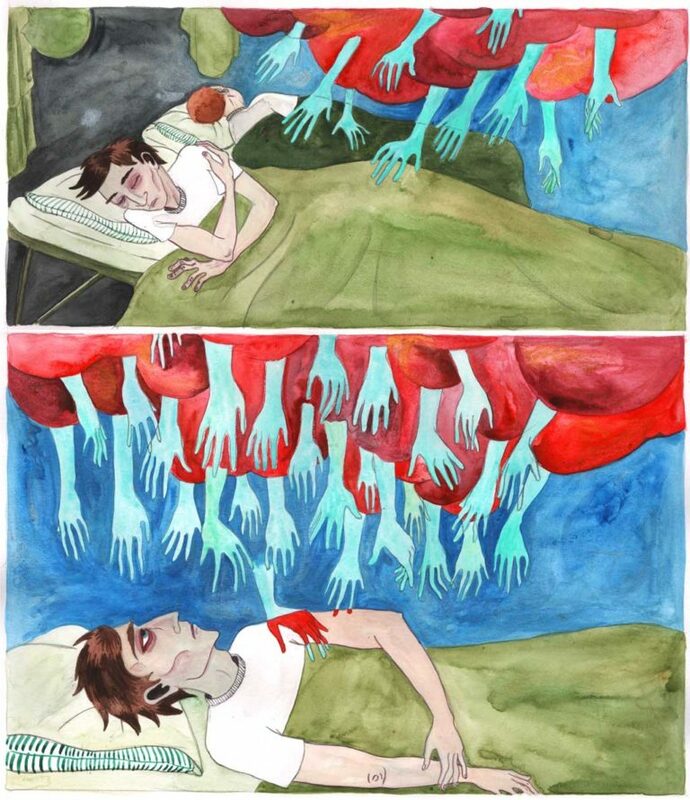 Leela Corman is an illustrator, cartoonist and teacher at the College of Fine Arts/University of Florida and the SequentialArtists’ Workshop. 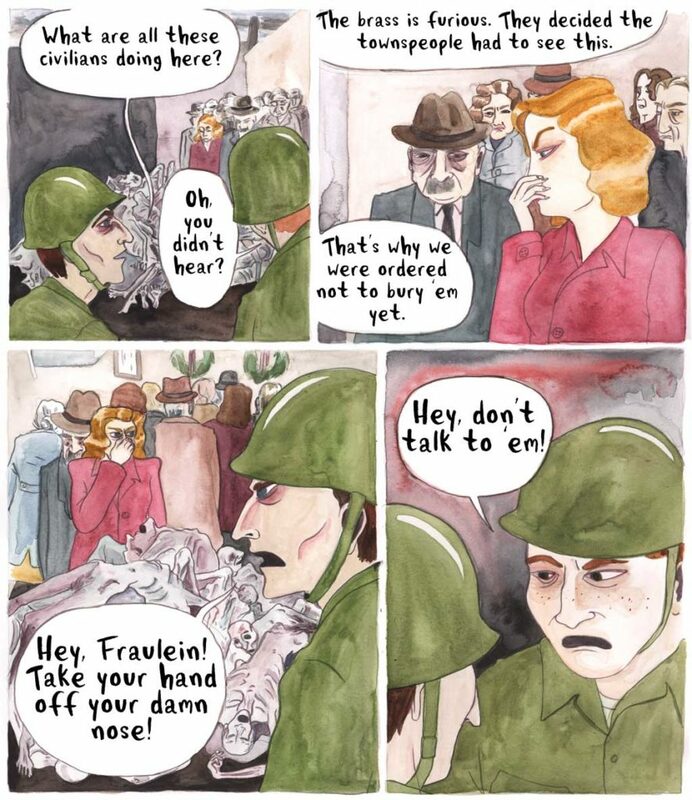 Corman recently visited Berlin to research her latest graphic novel, Victory Parade, which is set during the Second World War in both Brooklyn and Buchenwald. Besides numerous shorter pieces, she has published the graphic novels Subway Series (Alternative Books) and Unterzakhn (Schocken/Pantheon), which won the Prix Millepages in 2013. What prompted you to set your new book during the Holocaust? I had gone through a long period of my life being obsessed with the Holocaust. My family were survivors who were not in camps – they were on the run, in ghettos and in the woods. And then I thought I was done with it. It had to do with a really specific and intense vision I had had of dying in Auschwitz, which went on for a long time, and my husband had to shake me out of it – it was head-down-to-the-ground relentless. This vision came to me as I was reading Ludwig Bemelmans’s The Best Of Times, his chapter about Dachau, in which he wrote that he could not draw in that place. WWII casts a long shadow, though, and when I had the idea for this book it became obvious I would have to re-engage with it. Often characters first come to me as figures in context – time and place – so you know that if you’re thinking about a Rosie the Riveter–type character then of course WWII will play a role in her story. I’ve always been fascinated by accounts of concentration camp liberations, so that was a natural evolution back into it. And veteran PTSD has been an ongoing issue in the US for many years, so that played a role as well. The people who stumbled onto the lagers were traumatized by what they saw. Also, in 2015 (with the impending US election) it started to become obvious that everyone was starting to think about such things again. I remember having this conversation with a friend at the time when Trump was starting to gain attention as a possible presidential candidate. My friend just said: “This is how it starts.” When two Jews are talking and one says that to the other, you know, you don’t need to elaborate. Looking at it now, my new book feels in part like an inadvertent form of activism. You’ve come to Berlin to collect archival materials for your book. Can you talk a bit about that process – what you are looking for, how you will use it and how (if at all) it influences the story you’re telling? This ventures into territory where I like to relinquish a little control. I don’t know exactly what my research is going to bring me but I do know it’s important. When I knew I was going to be in Denmark to teach, I realised I would have to take advantage of being on the continent to go to Buchenwald, which is where the end of the book takes place. There is no substitute for on-site research. If you can get to the place you are writing or drawing about and experience it – the life, the weather, the scent – your work becomes vested with that power. I was really fortunate when I I was working on Unterzahkn because I was able to go to the Lower East Side Tenement Museum all the time. There is so much background, so much scaffolding that goes into making a really intense work of fiction in any form, whether it’s dance, theatre, a comic – anything. And as an audience there is so much you aren’t going to see, but you will feel it. Doing research activates the place’s presence in your work as well. I mean, I wasn’t interested in the Lower East Side until I had to be: when I started the research was when the neighborhood started waking up for me and then I kind of fell in love with it. Your work is often based on real events, either biographical or historical. Can you talk a bit about your relationship to ‘facts’ as an artist and a storyteller? Well, my relationship to facts is stronger than Ronald Reagan’s or Donald Trump’s! To me it’s crucial to sustain a fidelity to human nature and the human condition. And if you are writing about actual historical events to maintain a fidelity to those as well, and to the accuracy of the humans experiencing them. I’m also interested in breaking down – no, destroying – the neat narrative of history. History isn’t neat. History is chaos. We try to make order out of the chaos later on when we are safe but that’s just not how it actually happens. I will say I have a kind of allergy to works of fiction that use real people. Some artists take periods of time and just turn them into a mishmash of caricatures and art direction. When someone randomly decides to put Charlie Parker or Abraham Lincoln in their short story, it annoys me. It is putting words in peoples’ mouths, people who actually lived. I feel like it undermines the writer too, somewhat. There are exceptions, of course. I don’t know, is that an answer? Hmm. My relationship with facts? We’re good friends and we occasionally date. 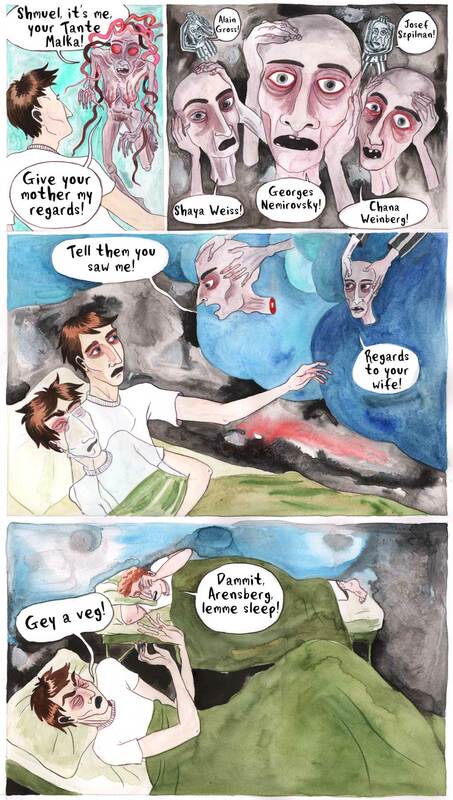 You mentioned the need to “drag work out of your subconscious.” In more than one of your stories that involves a sort of creative summoning of the dead. What is the effect that has on you as a graphic artist? When it’s really serious stuff I’m working on, it’s hard on me. It’s hard on me and it’s hard on my family. I have to make a really strong break between my work day and my family day. I finish, I put everything down – if I’m painting, I wash my brushes and clean everything up – I leave my studio and I get on my bike or I walk home listening to music to clear my head. And when I open the door when I get home there’s my daughter and it’s like – here’s life. When I’m working on something that’s not quite as dire as the Shoah, it’s not quite so intense. But I’ve created routines for myself to help with it. I was a belly dancer for a long time and that was my alternate life – I was teaching and performing – and now I have this band in its embryonic stages, so I’m singing, and that physical activity really helps. Unterzakhn artistically recaptures a part of New York that is no longer there. What are your thoughts on gentrification? It’s interesting. On the one hand research for my books has allowed me to cut through the gentrification to revive what those places once were. But talking about the Lower East Side and what it was like over the past few decades and what it’s like now: it’s growing increasingly out of reach for ordinary people. That said, even though the Lower East Side is one of the neighbourhoods in New York that has gentrified a lot, there is still more of it there than in other places. I don’t know why that is, possibly because there are housing projects there that are hanging on – there are NYCHA (New York City Housing Authority) houses as well – and because the LES is still an immigrant community, now Chinese and Vietnamese instead of Jewish and Italian… But it’s also because of places like the Tenement Museum and the Museum of Chinese In the Americas. In those places there’s an awareness of trying to maintain memory and to keep people aware of the history. The Tenement Museum is such a great establishment for that. Of course, New York being what it is, it will keep on changing. It won’t ever stop. In an earlier article you said you were not so interested in autobiography, but you’ve mentioned that you’ve since changed your mind. Why? I think I’ve just gotten to the point where I feel like I have something interesting to say about my own life – something I just didn’t feel before. And by “interesting,” I mean that I feel like I have something to say that is applicable to other people. I believe it was the choreographer Bert Balladine who said that a woman doesn’t have anything to dance about until she’s over 35 years old. Have any of your other views on comics and stories changed? I feel like there are so many interesting things that happen after you hit 40. I don’t think it’s automatic but you have the potential as you get older to access much more power as a creator; it’s like you just open a channel. I feel like I’m at the beginning of that, so I can’t talk with much knowledge about how it happens or why it happens, but I think it’s really fascinating. I would love to hear artists from other disciplines talk about this because I’ve also noticed that a lot of my favourites – musicians especially – are doing these new and incredible things. I’m thinking about Alexander Hacke (Einstürzende Neubauten), Blixa Bargeld, Thalia Zedek – they are just making better and better music all the time. I mean, look at Nick Cave! I don’t know how I would feel, though, if I were a ballet dancer or had an artistic career that depended on being young. I started belly dancing when I was 30, but I had a good chunk of time with it. In terms of comics artists: Jaimie Hernandez, Carol Tyler – I see so many people doing their best work these days. You mentioned that much to do with making and teaching comics has changed since you started with the medium. Do you think these changes are good? Bad? What kind of effects do you think they will have on the work that gets made in years to come? There’s always the danger of accidentally sounding authoritative about something, of being one of those people who says, “It’s not the way I was taught, so it’s bad!” So I’m not going to be that person. I think it’s great that people can study comics. The only thing I want to make sure of is that the art form stays wild – I want people to still have access to their own style, for that to not become standardised. And I think it’s possible. I mean, there will always be people who want to draw in standardised styles, and that is okay – there are people who are really into manga and variants of that, and that’s fine too. But there is, and needs to remain, room for everything in comics. And this will happen as long as we teachers remember to nurture students’ original styles. I’d love to hear someone who has really been on the forefront of comics education talk about this – James Sturm or Steve Bissette, for example, who co-founded the Center for Cartoon Studies (CCS). They are both totally different cartoonists and also really great and articulate guys to talk with, and who really care about their students. Tom Hart as well, Lynda Barry, Lauren Weinstein – she’s a genius and a great teacher who’s been teaching comics for 15 years at least. I do wonder, though, if it’s different for people like Lauren who teach at the School of Visual Arts in New York (SVA). The programme at SVA has existed for a lot longer, so I feel like it’s become a legacy, whereas places like CCS, the Sequential Art Workshop or the Savannah College of Art and Design are more like early adopters of this newer educational paradigm. Then, of course, there’s the Animation Workshop in Denmark, where I just taught. How does your work develop in conjunction with editors? Do you have to do a lot of redrawing? No. If I have to, I do, but I try to keep that to a minimum. With Unterzakhn I sent my editor thumbnails and she sent me edits to work from. The thing about edits is that you don’t have to do everything suggested – I took on some of the suggestions and ignored others. I like to think I’m easy to work with but I definitely will advocate for myself if necessary. Shorter pieces are more like illustration jobs: I send the art director the sketches, we go back and forth a little bit, but mostly I’ve been left to my own devices. Victory Parade will be published in the US by Schocken/Pantheon in 2019.